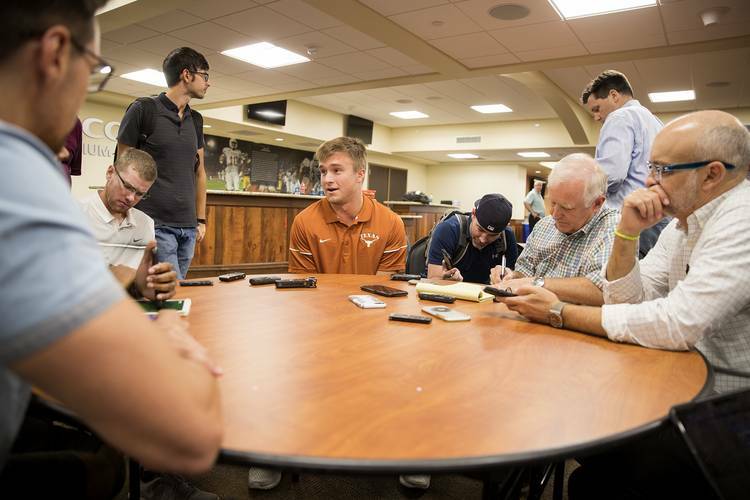 Neither Shane Buechele nor Sam Ehlinger seemed concerned Tuesday about their offense’s performance in Texas’ first preseason scrimmage last weekend. Head coach Tom Herman had previously said that UT’s defense won Saturday’s scrimmage, which was not open to the media. The offense committed a few turnovers in the scrimmage. On Tuesday, Buechele had adopted an “iron sharpens iron” approach to reviewing the showdown with UT’s defense. Ehlinger, the sophomore who is battling Buechele for the starting gig, gauged that the offense played better in the scrimmage’s second half. He later added that he “100-percent” knows the offense has improved from last season. Those turnovers remain a concern, however. Texas lost 18 turnovers in 2017, three of which led to heartbreaking losses to USC, Oklahoma State and Texas Tech. The defense, meanwhile, created 26 turnovers, so they’ve served as the perfect foil in practices. Headlines not a distraction: It was reported last weekend that Herman, who served as Ohio State’s offensive coordinator from 2012-14, was the tipster for Brett McMurphy’s story about domestic violence allegations against ex-Buckeyes assistant coach Zach Smith. Ohio State coach Urban Meyer is on administrative leave as the school investigates his handling of the situation. Herman has denied that he was McMurphy’s source. He acknowledged that his wife, Michelle, provided Courtney Smith, the coach’s ex-wife, with financial assistance in March 2017. On Tuesday, both Buechele and Ehlinger said Herman’s alleged association with the story had not been a distraction. Ehlinger also was asked how safe he felt in the wake of the much-publicized troubles at Maryland, which plays Texas on Sept. 1. Maryland coach DJ Durkin was placed on administrative leave last weekend following ESPN’s report about offensive lineman Jordan McNair’s death and the Terrapins’ strength and conditioning program. Injury update: Texas announced after Tuesday’s closed practice that running back Tre Watson was a full participant. Watson, a graduate transfer from Cal, had been limited as he recovered from the knee injury he suffered last year. The Longhorns did not offer any updates on linebacker Ayodele Adeoye (knee) or defensive backs Davante Davis (hamstring) and DeMarvion Overshown (knee). Those three defenders were injured in Saturday’s scrimmage.